CALL FOR SUBMISSIONS for the European Collaborative Housing Awards. 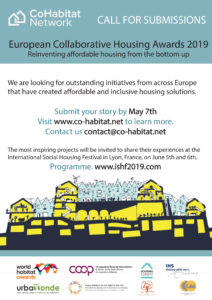 Submit your affordable and inclusive collaborative housing solutions by May 7th and win a chance to attend the Int’l Social Housing Festival in Lyon this June! Visit www.co-habitat.net/europe-2019 for more details. • Present your project at the European Collaborative Housing Day, which will take place during the International Social Housing Festival on June 5th and 6th in Lyon, France. • Share your experiences and network with inspiring organizations from the field of housing and urban development. • Receive a public recognition (European Collaborative Housing Award) and gain public exposure and visibility. • Enter the shortlist of the World Habitat Awards 2020 (organized by World Habitat and UN-Habitat). • Be part of a growing community of collaborative housing peers! The European Collaborative Housing Awards are an initiative of CoHabitat, a network of community-led housing organizations and allies from across the world, who work together to secure housing rights through collective, non-speculative, people-led solutions.